Polar Bear Flip-Flop: People Hated, Then Loved These Photos. What Changed? A 1,200 pound male polar bear (especially when it's autumn and he hasn't eaten for four months) doesn't make play-dates with an animal from another species. He doesn't arrive every afternoon to cuddle, nuzzle, hug and roll around with a dog. Brian Ladoon claimed it was happening, but Norbert Rosing thought Brian was smoking something. He wanted to see for himself. Rosing was (and is) a famous nature photographer, who for a time specialized in polar bears. Back in 1991, Brian Ladoon owned a bunch of huskies and kept them loosely chained behind his house in Churchill, Manitoba. In the fall, hundreds of polar bears arrived in and around Churchill to wait for ice to form on nearby Hudson Bay. When it got cold enough, they'd walk, sometimes right through town, jump on the ice and sail out, looking for seals and fish to eat. On an autumn afternoon, Rosing settled down at Brian's house and waited for the bear he thought would never come. In fact, when these pictures were published, people hated them. Hated them. In his new book, Wild Ones, Jon Mooallem says photographer Rosing "was besieged by angry faxes and phone calls," from people who thought the photos couldn't be real, that the dog was probably put in the bear's path, "chained up as bait for the white monster." This wasn't play. This wasn't innocent. This was the prelude to a kill — "a sinister trap." The bear, they said, was about to spring and bite the dog; when the pictures stopped, the bear pounced. The dog, they imagined, was probably terrified. No one wanted to look at these photos, Rosing told Jon. "People just couldn't believe it," so he didn't try to sell them. He just stashed them away. But then, 13 years later, those very same pictures – as far as I know, nothing changed, nothing added — appeared in the video I've posted. Public radio's Krista Tippett had invited Stuart Brown on her show, Speaking of Faith (now called On Being) to talk about animal play. Stuart showed her Norbert Rosing's photos, which were then put on line, and the reaction was a total flip-flop. This time, (2007), the audience wasn't angry, wasn't suspicious — on the contrary, people loved them. Loved them. They emailed the cuddling scenes to friends, and the play seemed totally plausible. 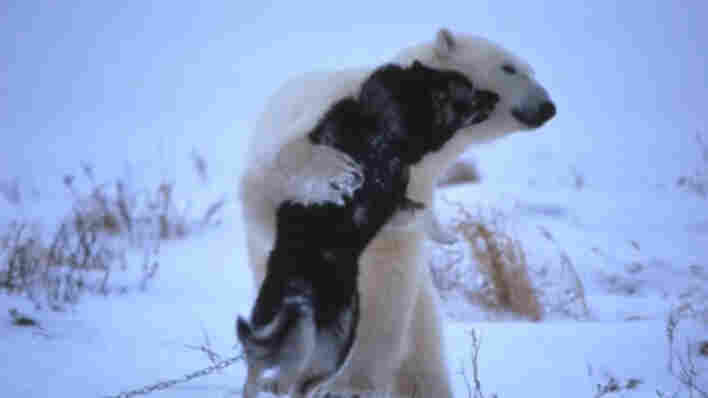 "It's hard to believe this polar bear only needed to hug someone!" said one email Jon saw, which ended with, "May you always have ... friends that care." Krista's video, when I last looked, had 420,142 hits. What happened? How could people, maybe the same people, just 13 years later stare at the same pictures and feel so differently about them? Mooallem has a theory. 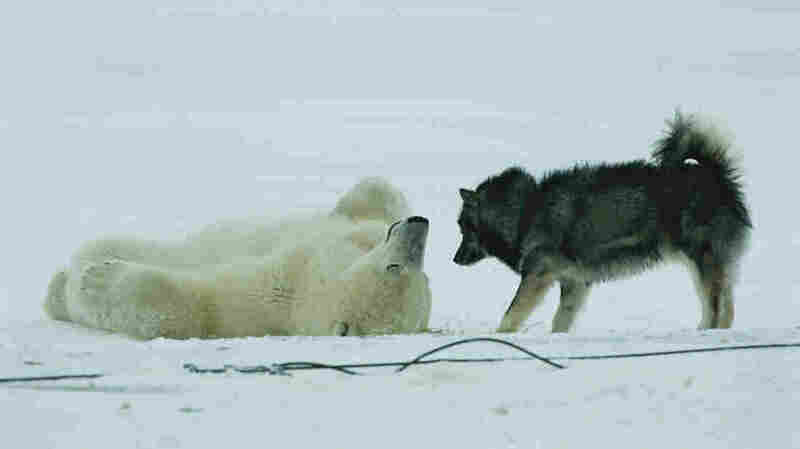 In 1994, he thinks, polar bears were still thought of as proud, dangerous, scary animals. A decade earlier National Geographic put out a polar bear video called "Polar Bear Alert" that begins with a young couple pushing a stroller through Churchill, while Jason Robards, the narrator, describes the town as the "one place in the world where the great white bears roam the streets, dangerously immune to the presence of their only enemy ... man." The dad had a rifle around his shoulder. He needed to, because these bears attacked. NatGeo's film was rich with bear clawings, bear murders. The most vivid scene was filmed in the tundra, when producer James Lipscomb was left alone in a rebar cage to await arriving polar bears. When they arrived and began snarling and clawing, he was in their faces, behind bars, filming. It was hot tape. It kicked off a vogue of cameraman-in-the-cage sequences in nature films about scary sharks, crocodiles, and grizzlies. This film made a particularly deep impression — that these animals were instinctive killers. Knowing that, feeling that, the sequence in Brian Ladoon's backyard made no sense. Vicious Lords of the Tundra don't nuzzle dogs. Thirteen years later, polar bears hadn't changed, but our sense of them had. By 2007, most people had seen scenes of weak, starving bears struggling to stay on shrinking hunks of melting ice. The earth was warming and polar bears had no place to go. Suddenly, they were vulnerable, heading to extinction. Animals, says Mooallem are "free-roaming Rorschachs." We see them through the heavy filter of our own feelings, our own needs. And our filter for polar bears had flipped. Animals who'd once been proud and vicious had become "delicate, drowning" victims, lonely animals — who now just might need the companionship of a friendly husky — who might come to a backyard, looking for a hug. Jon Mooallem believes that the stories we tell ourselves about animals totally color how we see them. "Emotion matters. Imagination matters, and we are free to spin whatever stories we want about them." The wild animals, he says, "always have no comment."